Under clear skies, a light breeze from the south-west blew across the grass airstrip. It was Thursday 5 March 1936 and K5054 - the prototype of R. J. Mitchell’s beautiful Spitfire fighter was about to make its maiden flight. Vickers Chief Test Pilot 'Mutt' Summers climbed into the cockpit and fired up the new 12-cylinder, liquid-cooled Rolls-Royce Merlin engine which roared into life with an unmistakable and soon-to-be-familiar sound. It was just after 4.30pm when Summers fully opened the throttle and K5054 surged forward and took to the air, the shape of its thin aero-dynamic elliptical wings soon apparent to all on the ground below. 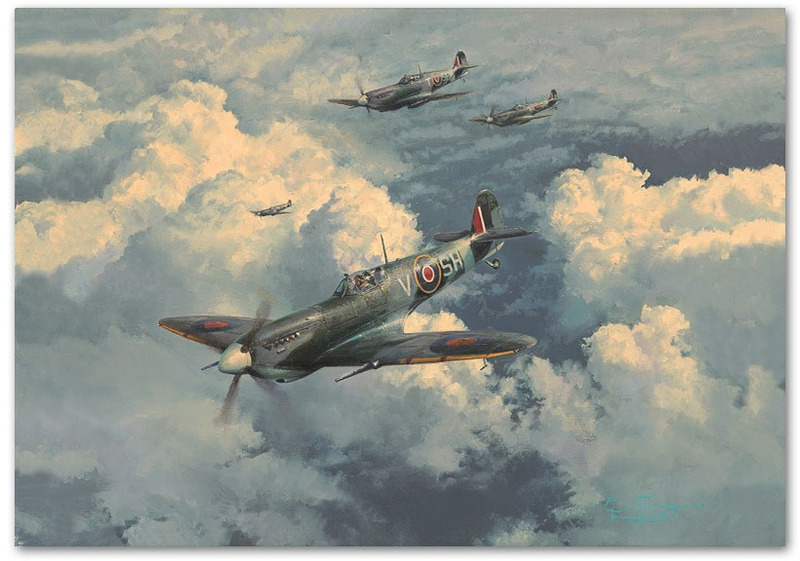 One of the most perfect fighting machines of all time had been born, and not a moment too soon because the dark clouds of war were gathering over Europe and the Spitfire would be on the front line during the nation’s darkest hour - the Battle of Britain. When the Luftwaffe unleashed the Fw190, the unsuspecting Spitfire pilots of RAF Fighter Command were at serious disadvantage.‘The Fw190 certainly gave the British a shock’ wrote Douglas Bader, and RAF Fighter Command was soon forced to scale back their sweeps over France whilst the engineers from Supermarine and Rolls-Royce raced to catch up. It took months, but by June 1942 the first of a new variant began arriving which, everyone hoped, was the answer to the Fw190 – the Mk.IX Spitfire. Each print in the remarque editions will have a delicately crafted original pencil drawing, skilfully created by Robert Taylorin the lower margin. Every Remarque drawing is different and unique.